I had a friend named Barbara Hirshkowitz who enlightened both our neighborhood and the world through her intellectual work and her activism. I knew Barbara for the fifteen years that preceded her death. 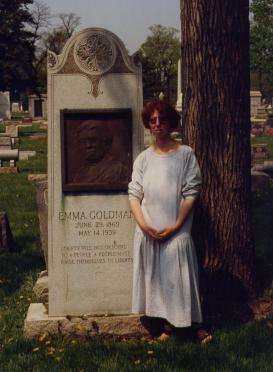 She was a personal friend and a fellow activist in the anarchist circles of West Philadelphia. If Barbara was still with us, I think she would tell me to tone down the praise that you are about to read, as modesty was one of her many virtues. But she’s gone, and I’m still here, so I’ll just offer what I know anyway. Barbara was born in Brooklyn, New York on January 9, 1950 and died March 2, 2007 of pancreatic cancer in her West Philadelphia home. When I first spoke to Barbara after she let it be known that she was fatally ill, she remarked on the irony of her situation. “I’m the most granola person in the world,” she said, “and here I am dying of cancer!” I always knew her as a person of robust health, and I remember only one health issue that she ever mentioned. When she lived in Davis, California as a young woman, she was surrounded far and wide by chemical-encrusted tomato farms, and from that period of her life, Barbara was allergic to all sorts of dust, mildew, and animal fur. Before living in Davis, she was never allergic at all. But the most striking statement Barbara made in regards to physical health was the grace with which she faced her death experience. She had always believed in living life in the moment, but in her last months among the living, she put those cards flat on the table. Once, she told me that she couldn’t sleep on a certain night for worrying about the young children in her collective household, and how their lives would go after she was gone. She got up crying and looked for a box of paper handkerchiefs, finding only one hanky left. She blew her nose and came to a new decision: since she was out of hankies, she would have to stop crying. Having made her decision, she stopped crying and went back to bed. Barbara’s obituary in the Philadelphia Inquirer contained the following information: She earned a bachelor's degree in theater arts in 1971 from Humboldt State College and a master's in dramatic arts in 1978 from the University of California at Davis. In 1983, Barbara spent six months in Japan with the Buddhist order Nipponzan Myohoji, and joined its annual pilgrimage from Tokyo to protest the bombing of Hiroshima. In 1984, she walked in four very long peace walks in the United States. Much of Barbara's peace activism was personal. 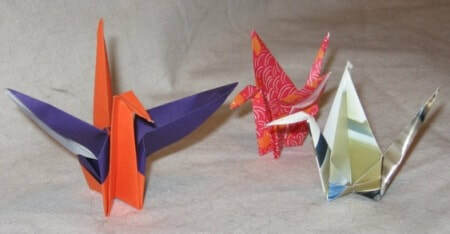 During the months before her death, she folded 1,000 origami peace cranes and gave them to friends along with the story of Sasaki-san, a young Japanese girl who made paper cranes while in the hospital dying of leukemia after Hiroshima. Sasaki-san left this poem: 'I will write peace on your wings, and fly you all around the world.'" ​The importance of Barbara’s Buddhism came back me about six weeks after her death, when there was a moving tribute to her at a Quaker burial ground not far from her home. Her own ideas formed most of the arrangements, and a few of them took me by surprise. About 150 of us gathered under a tent to share our Barbara-thoughts. There was a song, and then about a dozen close friends and family spoke about her, bringing on tears all round. A boy named Ray, who lived in the same house with her for all of his eight years, said, "Barbara was a Bodhisatva, and now she's a Buddha." Afterward, we planted trees in the cemetery, leaving handfuls of Barbara’s cremated remains under the roots of each. In circles of ten or twelve, we took turns speaking a few words of memory and then nourishing the tree with her ashes. Still later, we burned some of her personal papers. A fire was made, and we immolated her get-well cards, diaries from her peace marches, and also her medical records. The surprise came when we burned Barbara’s two favorite hats. One of the hats was very familiar to me, having covered her head on many occasions with a certain hobo aspect. I saw faces on that cold, windy day for the first time in many years. I remember Barbara describing her work at a major publishing house in Manhattan. All of the day’s work would be done long before noon. Barbara would stroll in Central Park for hours while the job waited to put money in her purse. She did not appreciate this privilege, and so she quit the job. After leaving her job in Manhattan, Barbara lived in California for twelve years, where she educated herself and became interested in Buddhism, as we have noted. Barbara moved house to Philadelphia in 1986 in order to join New Society Publishers, whose focus was Peace Studies and Non-violent Conflict Resolution. It was during her tenure at NSP that I first became acquainted with Barbara. I knew her slightly before this, but one evening we trudged through a heavy layer of snow to see the Chomsky film “Manufacturing Consent” at a nearby theater. By the time we trudged back to the neighborhood, I already knew that she was an intellectual prize-fighter with a gentle touch. The main activity I shared with Barbara through the years was Books Through Bars, a group that sends books to individual prisoners for free. When this activity began in the early 1990s, it was one person sending books to a handful of inmates from a small publishing house (NSP, where Barbara was a publisher). I remember the way it developed into weekly meetings, with volunteers sometimes sending more books, but sometimes not making an appearance. The facilities were mildewed and crowded with useless furniture. Barbara got involved after the group had stumbled along for a few years. She later told me that she “wouldn’t give a nickel“ for the organization as she found it. But at that same point, realizing the enormous and unsatisfied need of prisoners for educational material, Barbara put her organizing skills into practice. She was neither a taskmaster nor a domineering figure in the group, but she was so deliberate and professional as an ordinary member that everything changed for the better. She would not let decisions lie undecided. She insisted on better management of funds and public outreach. Her selfless dedication and her obvious intelligence attracted more and more reliable people into the group. Today, Books Through Bars is a huge affair, literally sending tons of reading material to prisoners every month, getting books donated from major publishers, raising money for postage in annual drives, sponsoring inmate art exhibitions, and making very efficient use of the space in which it operates. But Barbara didn’t let the mailing of books be the only way she acted in solidarity with prisoners. At her memorial meeting, a letter from a former prisoner was read. It was from a "country girl" who was released in New York City after fourteen years in prison. She had never been to a big city before. Barbara went to meet her with another Books Through Bars lady who, like Barbara, had grown up in Brooklyn. They walked the lady around Manhattan all day, took her out to eat, and then got her safely on her way home. The former inmate’s letter was written when she learned of Barbara's death, and it was pouring over with gratitude. One got the impression that this one day of special decency will inform the woman's mind all through her life, and that it saved her from a terrifying journey. I was born on Long Island with woods all around me, and I remember the terror I felt when I first climbed up those NYC subway stairs alone. Barbara’s love of books and film was another of her determined activities through the years when I knew her. She and I would sit and read aloud to each other Albion Tourgee’s A Fool’s Errand , and A Girl Among The Anarchists , and a few of the “jungle novels” by B. Traven. I wasn’t her first, nor her last reading partner. Her close friend and fellow meditator Tim Dunn read several books to her in the last months of her life. Barbara also held “movie nights” in her home, with the most expert choice of old films and the living room packed with people and nacho chips. There were “Theater Nights” as well. An informal group would announce an upcoming play and invite everyone to come and enjoy the thing. For about a year, this activity found scores of my neighbors in front of fine actors and timeless playwrights. Barbara was always there, staring wide-eyed at the stage and discussing it later with passion. Although she did not talk about anarchism often, I remember Barbara’s way of anarchism in her use of the truth. She behaved in the opposite way from the way I behave in certain situations. When I look into the eyes of a person I do not trust, the last thing I would ever dream of is to tell them the truth. But there was never any occasion or situation where Barbara would let words pass from her lips unless she actually believed them. It could be anyone, from a local rowdy to an obvious police spy. Barbara would use the actual fact as a weapon for the common good. Whether she was speaking with a possible friend or a likely enemy, she would always address the person with personal decency, and this was what the listener had to deal with, whether or not they liked it or expected it. In some cases, I would have shouted curses at the person or made them feel as uncomfortable as I could manage. Barbara, on the other hand, would look into those same eyes and offer a morsel of reality, in such a way that the immediate situation would become a more respectful one. We would sometimes debate the matter afterward, but it’s only now that I see Barbara’s way as the better choice. I barked at the opponent. She spoke calmly. Barbara enjoyed growing food in our local community garden. I remember when she recruited me to drag a very serious chunk of concrete out of the earth, which was a remnant of the factory that predated the garden and took a whole morning to remove. With that old slab out of the way, Barbara’s garden plot gave more nourishment to the neighborhood, which was well worth all the sweat. Because I am inept in financial affairs, I was always struck by Barbara’s obvious gift in choosing the smartest possible ways to direct her resources. She was a tax resister for decades, sensing that there might be more constructive ways to use her earnings than to let government officials squander her money, or steal it, or turn it into widespread death and sorrow. Barbara would sometimes loan money to her friends, but not casually. It was always for a specific reason, and there was no chance that Barbara would wave off the debt unpaid. She lived comfortably but without luxury, always seeing every dollar serve a sensible purpose. Barbara is different from almost all the others, when I think of my dead anarchists. The difference is that I know the sound of her voice and the way of her smile. Our departed comrades remain, loud and clear, in the memories of the living. Barbara will speak to me, educate me with her quiet wisdom, and calm me down as long as I live. She was one of the brightest and the best anarchists that we’ve ever had.